I've made this mistake more times that I would like to admit. I've been working in an assembly in Autodesk Inventor, and when I create a component, I forget to rename it and I end up accepting the default of "Part1.ipt". Naturally, I don't realize that I've forgotten this step, and I end up creating an entirely new, default, name I never intended. To make matters worse, I usually don't realize this until I've created a detailed part. As a matter of face, I usually realize my mistake when I'm actually saving my final version. Essentially, what I've just described is a situation where I've created a new component, fouled up the name, and gotten to a point where undoing it and starting over isn't my best option. So how did I manage to get out of it? 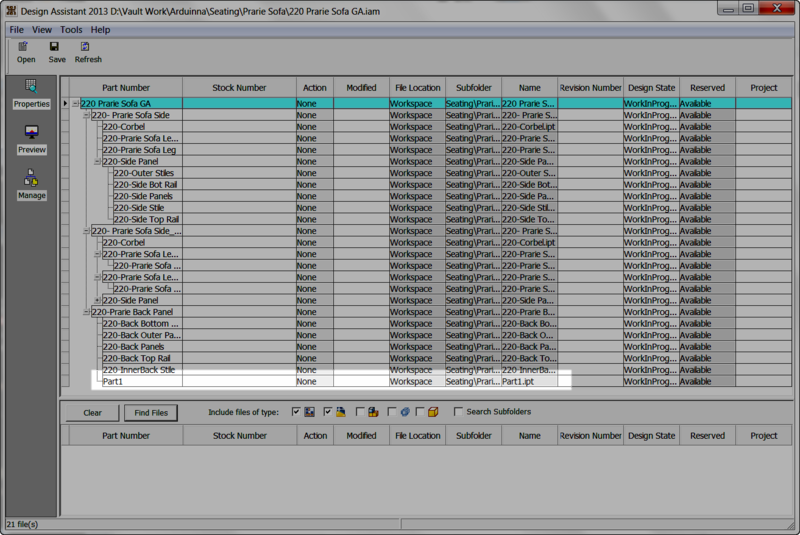 My first option was to check the files into Autodesk Vault, and rename them there. That option works just fine, and I've used that in the past. But what I really wanted to do, was rename the files before I put them in Vault. I just didn't want to check the assembly in just to rename them in Vault. To rename the offending file, I used a tool called Design Assistant, which is included in Inventor, and doesn't require Vault. As a matter of fact, it doesn't need Vault at all. What is Design Assistant? How does it work? 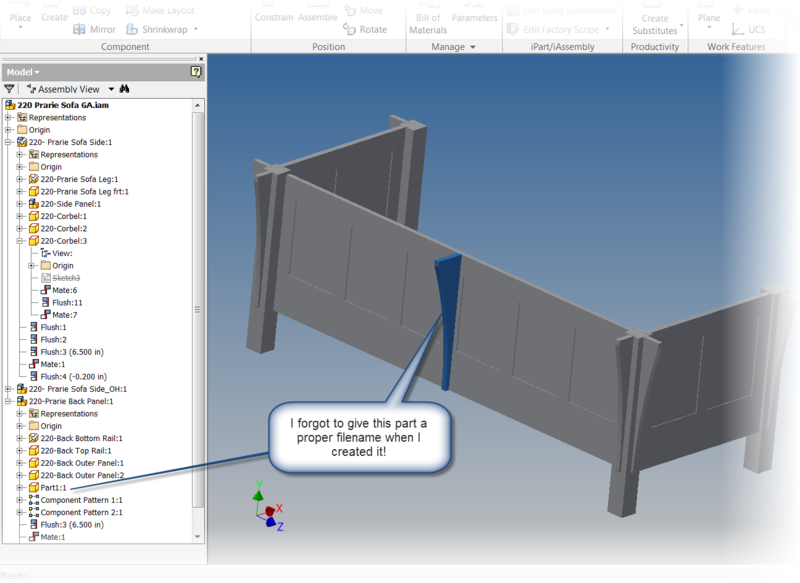 Design Assistant is a tool, included with every installation of Autodesk Inventor that is intended to help with file management. It has several tasks, but one of which, is to rename files So where is it located, and how did I get to it? My first step to locate Design Assistant was to go to Windows Start>Autodesk>Autodesk Inventor 2013 and locat Design Assistant. Starting it up, I need to choose the assembly containing the part I've messed up. Once the assembly is open, I chose the "Manage" option. Now I can see the components that make up the assembly. In my next step, I find the component I need to rename. I right click on the the "Action" cell, and choose "Rename". Right click and choose "Rename". Now the component's row highlights. 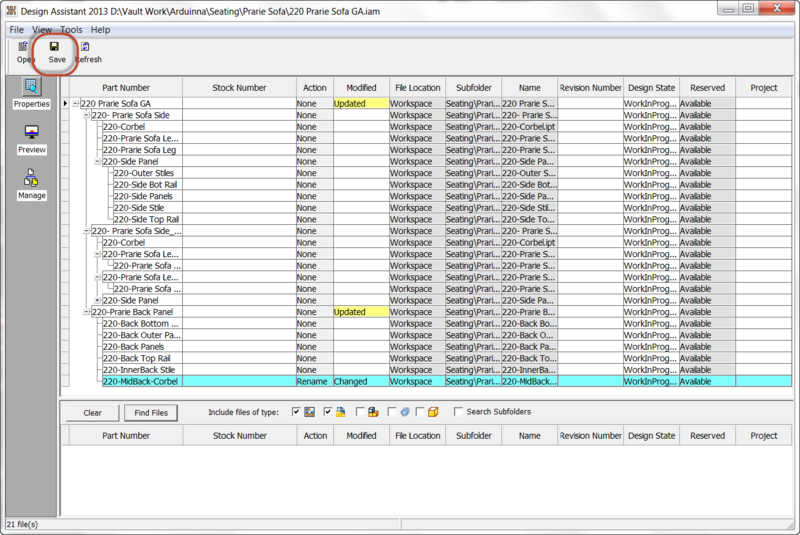 Next I choose the component's name and select "Change Name"
Choose "Change Name". Notice the Action cell has changed too! A dialog box opens and I can now rename the file. With the file renamed, I save the changes, and I'm ready to go. All that's left is to click "Save"
I can now check the files into Vault, and the correct name goes into Vault, without requiring that I go in and change it. Checking into Vault, and I'm done! 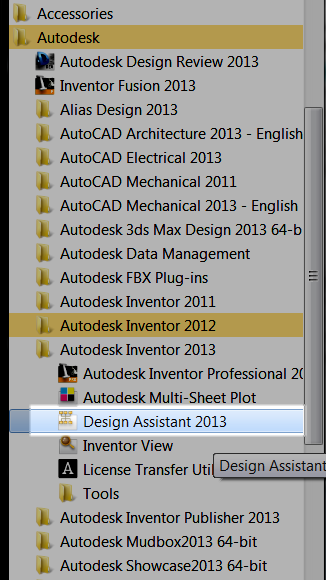 So that's how a file can be renamed using Autodesk Inventor's Design Assistant. But before I give you the video, there are a couple of things to note! Yes, I know I'm repeating myself. But I think it's worth repeating! Design Assistant doesn't require Vault. So if you're a user who isn't using Vault, this can help out a great deal. However if you are using Vault, don't use this to replace Vault's Rename tool. As a matter of fact, if the file is already vaulted, make sure to use the Vault Rename tool! Design Assistant should only be used for files that aren't in Vault yet! Failure to heed this warning could lead to file resolution issues, and being excessively mocked by your peers! On that note, here is the video! I hope you find it useful, and make sure to use it wisely! And if there's any experience you'd like to add, throw a comment in below! A comment below mentioned that they had lost links to drawings when using the process. Most of my work with Design Assistant didn't involve drawings. I rarely, if ever have drawings created when I'm using Design assistant this way. However, I did find a link on the Autodesk Discussion Group here, that addresses this. Sorry if I caused any confusion, I hope this makes this tip a little more complete. 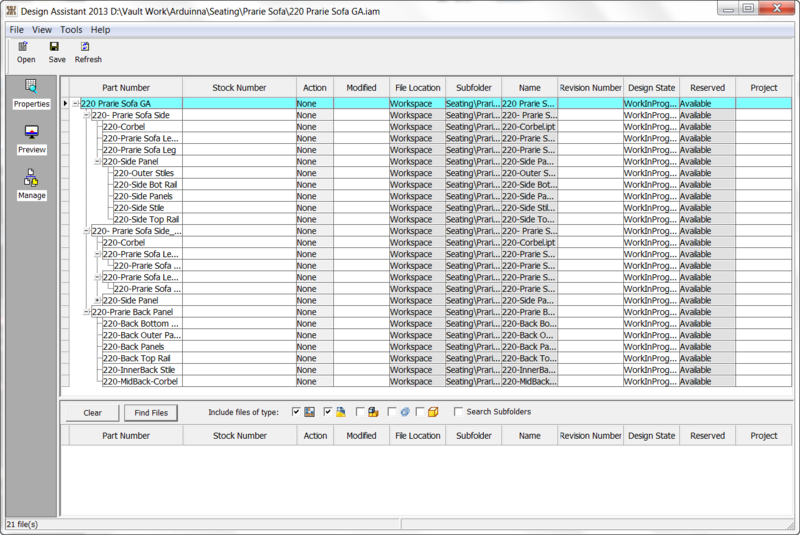 If part1.ipt is used in only 1 assembly the command "save and replace" will do that with one mouse click. Working with or without Vault won't matter, works always. Save and Replace. I always forget that one! A valid option for sure. I don't like the fact that it doesn't get rid of the old file (although it's not designed to). DA does a true rename without the clutter. But on the other hand, removing old files is easy enough with a little diligence. It's definitely a valid approach. "Save and Replace" and "Ground and Root" are my to favorite timesavers. Usually I don't care about naming the parts until the assy is finished. Only then I start naming the parts using "Save and Replace" because its more easy to think of meaningful names when you see the whole picture before you. I use DA especially for copying Iproperties when the modeling work is done. 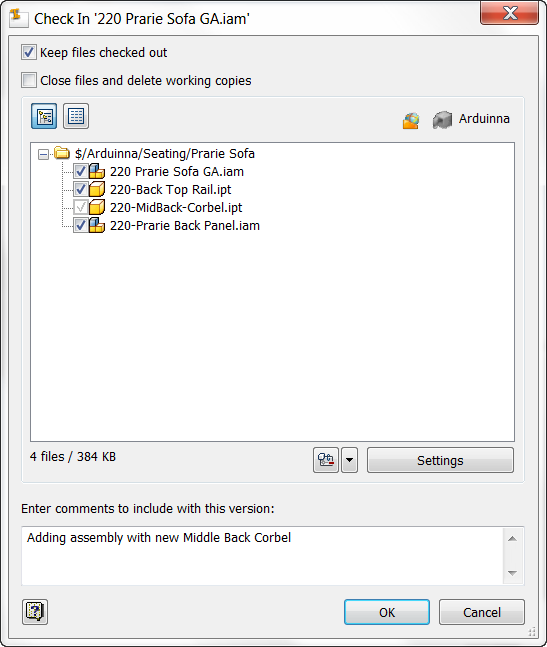 I used Design Assistant to rename files in an assembly, which worked good for the assembly, but not the drawing. A lot of the parts were used in multiple drawings and now I have unresolved references all over the place! What happened? Is there an easy way to fix the links, or do I just have to trudge through them manually? I can't say that this will fix the broken links (you may have to trudge through them). But it's worth a try. Thank you for the information, i have a question, this method is functionally with components from content center, these parts can be reused? Cristian, you would have to copy the content center out of the library, but then it could be renamed. If you want to rename the content center part and maintain a relationship, you might consider "Save and Replace", or even create a custom content center library.